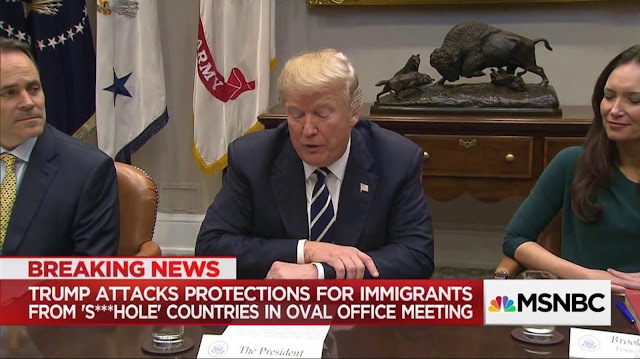 This week the President of the United States, while discussing immigration from Haiti and Africa, questioned why the US would want people from "shithole" countries. The President (and readers of this blog?) may not realize that there are numerous motion pictures that would not exist, but for authors from “shithole” countries. Two examples from one author? 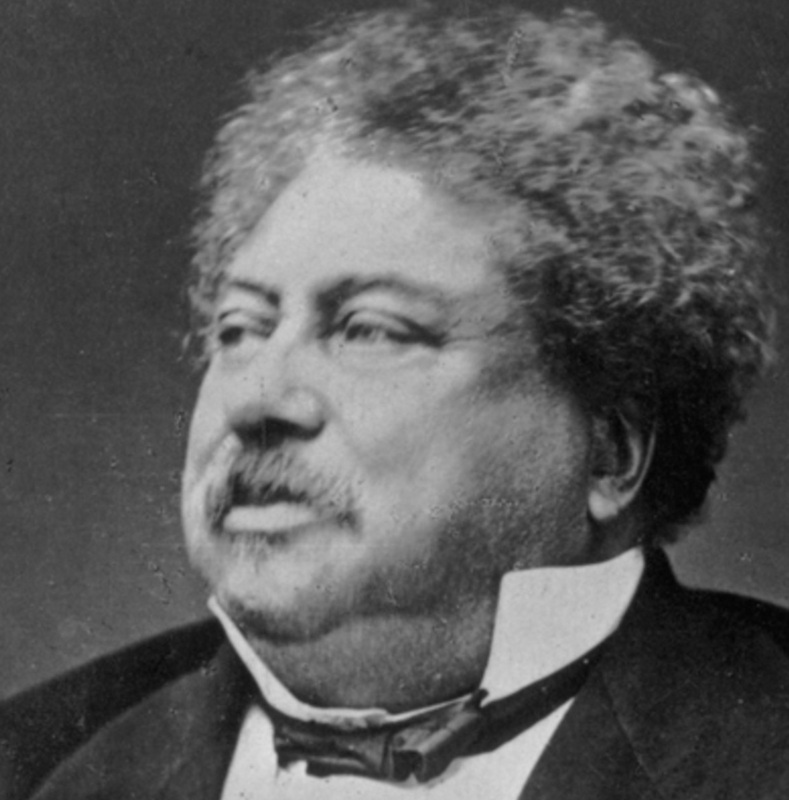 The Three Musketeers and The Count of Monte Cristo were both written by Alexandre Dumas (pictured below), who lived in France, but whose background might, even today, help explain what it means to be Haitian. 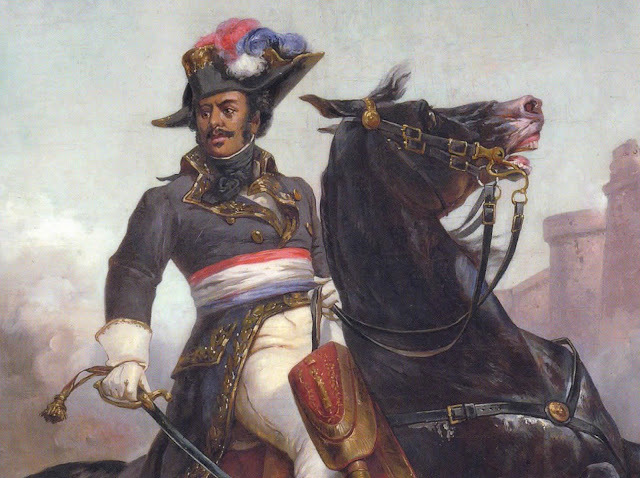 Many people may not realize that Alexandre Dumas’ father, Thomas-Alexandre Dumas Davy de la Pailleterie (pictured below), was a black man and war hero, born in 1762 in the French colony of Saint-Domingue - present-day Haiti. Thomas-Alexandre Dumas Davy de la Pailleterie's parents were Alexandre Antoine Davy de la Pailleterie, a French nobleman and Marie-Cessette Dumas, who a contemporaneous letter says was purchased from a Monsieur de Mirribielle “at an exorbitant price," and then years later, sold, along with her two daughters, "to a... baron from Nantes". Just to make my point crystal clear, the man who wrote “All for One and One for All” was the grandson of a slave - and his father (one of many from his homeland who have served proudly in the military, but who, to my knowledge remains the highest-ranking man of African descent ever to serve in a European army) was Haitian. Note: The poster for The Three Musketeers silent film above is from the 1921 version, that starred Douglas Fairbanks and Adolphe Menjou. If you enjoyed A Hard Day's Night (1964), you might want to see how director Richard Lester handled the same basic story in 1973, with stars like Oliver Reed, Raquel Welch, and Richard Chamberlain. 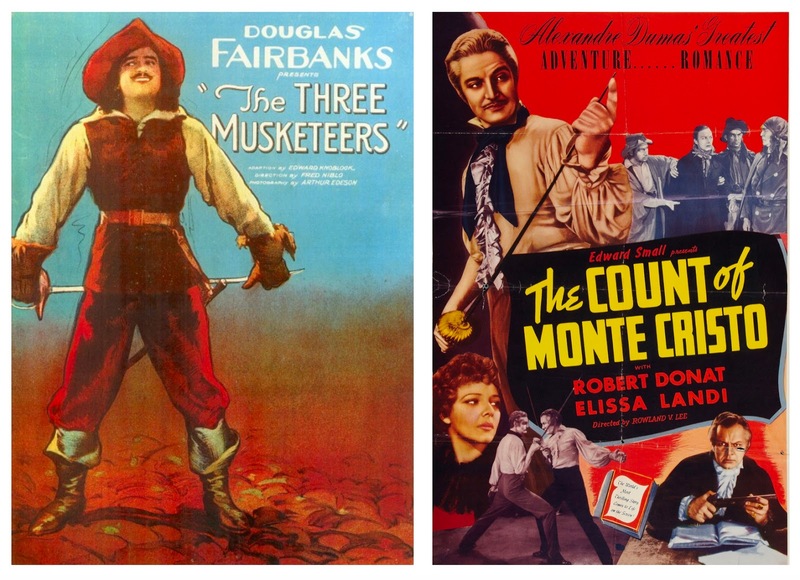 The Count of Monte Cristo has also been remade many times as a motion picture. The 1934 version with Robert Donat as Edmund Dantes (poster above), made a big impression on me when I was a kid. But in hindsight, it's not a fully satisfying retelling of that great story. I didn't think the 2002 Hollywood version, directed by Kevin Reynolds and starring Jim Caviezel, got it right either. Perhaps versions I have yet to watch, like a futuristic retelling in anime, Gankutsuou: The Count of Monte Cristo (2004), or a reputedly more faithful 1998 French TV mini-series version, starring Gérard Depardieu and a raft of great French actors, or a (hard-to-find?) BBC miniseries version from 1964 starring Alan Badel might offer better options.